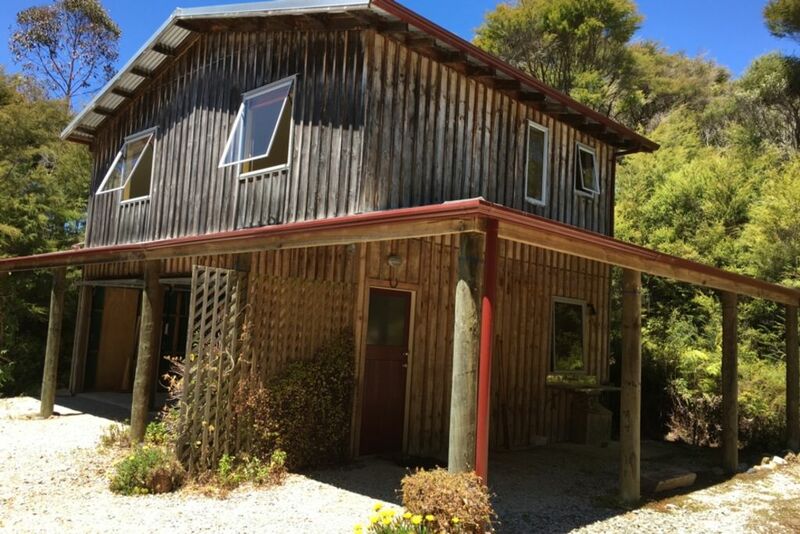 Kanuka Cottage on the gorgeous OceanSpirit property is a perfect place for one or two to relax or use as a base for exploring Golden Bay, or before or after the Heaphy Track and Abel Tasman. It's a perfect base for adventure outings, artistic opportunities or even a writer's retreat. The fishing is good just off the beach, either with a Kontiki or boat; the beach is gorgeous from dawn to starlight. Had a tough year? This is a place to re-energise. The tui and fantails will provide the bush-song; the beach is safe for swimming, paddleboarding and kayaking and the locals are friendly. There is even mentoring available for writers trying to shift that darn writer's block. Kanuka Cottage is two-storey with room to park your vehicle, a boat, bikes, jetski or kayaks in the garage or outside. Come upstairs and you'll feel like you're in a tree house: the living area, dining and kitchenette are in one room, with views through large windows on three sides. The kitchenette has a full range of crockery, cooking utensils, gas hob and oven, and bar fridge - just bring your food and if you've forgotten an essential grocery item, there's a good chance it will be available from the main house. There is a bathroom with shower and toilet, washing machine and dryer. And don't sweat about the beach access - if you have a 4WD vehicle, just drive 200m along the beach Patons Rock Beach Road and up the driveway, past the orchard to Kanuka Cottage. Wave to the sheep and Muscovy ducks as you pass. Only on a high spring tide is access a problem, for about two hours, max - it's part of the adventure. If you don't have a 4WD, we'll collect you and your luggage from the reserve. It's part of the charm of OceanSpirit. Please note: For enquiries made from May to September 2017 for October onwards, there may be a delay of a few days before we can respond. We thank you for your patience. Four-wheel drive access only to negotiate the short drive along the beach to the property, however it is only a five-minute walk to the cottage from the road and the owners can provide pick up service when you first arrive and depart to help with luggage. Minimum three nights' stay unless by negotiation. Lovely quite and peaceful accomodation. Lovely quite and peaceful accomodation. Recommended to anyone wanting to get away from lifes pressures. A slice of Golden Bay heaven. A little non-plussed to discover the road ended at a reserve and it was either on foot along the beach or the owner's 4 wheel drive. How far? Not far! Once there, the soft slap of waves on wet sand and the chirruping of the fantails was all we could hear. This idyllic spot is good for the soul and heals even the most harassed city dweller. Thoroughly recommend Kanuka Cottage's beautiful position, comfort and glorious views. A great spot with great access to an amazing beach. A great spot with great access to an amazing beach. The house is comfortable and spacious with fantastic sea view - the Farewell lighthouse flickers faintly at night. The walk along Paton's Rock beach to get to the house is part of the charm. If you are wanting to get away from it all and Wake up to birds chirping, the sound of the ocean then this is the place for you. In this crazily busy world Kanuka cottage is a breathe of fresh air. So close to the beach, a delightful orchard and nature bush what more do you need. Felt blessed to be able to enjoy it. Did not want to leave. Thanks for sharing your slice of paradise Rebecca.. The location is fantastic! Very secluded and close to the beach.